Gossip Girl: The Serena Chapter | Pop.Bop.Shop. 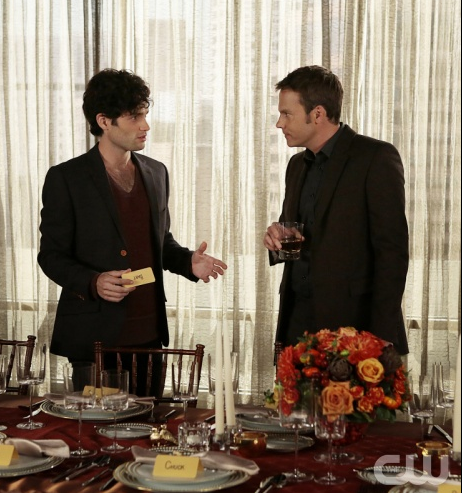 We celebrated Thanksgiving tonight on "Gossip Girl." I have to say, this drives me crazy. Thanksgiving was two weeks ago. Why can't they time the episode appropriately? Serena and Dan decide to host Thanksgiving as a couple. Blair doesn't want them together so she orchestrates for Sage and Steven to run into Serena at the grocery store. Sure enough, Serena invites them and the competition begins. At dinner Steven tries to win back Serena but she protests, "Dan is my first life and he will always be." Awww, how cute. Meanwhile, Nate tries to wake Chuck from his funk by telling him about a new death likely at the hands of Bart. Bruce Kaplan, a business manager, died while on Bart's yacht. Chuck is only interested and drinking and lying in bed. He even bans Blair from the Empire! Of course Blair refuses to be beat and makes her way into their apartment, complete with slutty Pocahontas costume. Once everyone has arrived for dinner, Nate and Sage sneak upstairs. Nate is attempting to break into Bart's computer files when Sage gives my favorite line of the night, "Babe, I came up to here to make out, not to watch you and Chuck play Wikileaks." Too good. All evening long Georgina has been harassing Dan about his Serena chapter for Vanity Fair. He sent it straight to the editor without showing her, which of course, made her furious. Georgina tracks down the editor's assistant who mentions that Dan submitted two chapters. Over dinner the Serena chapter gets released and Georgina announces it to the table. Serena is humiliating and confronts Dan pleading, "I thought you were different." To which he replies, "I used to be different and it got me nowhere, so now I am the same." Before Dan can leave Nate make sure to punch him in the face. At the end of the hour Lily has turned from Bart's corner to Chuck's. After Bart put his hand on her, she became scared and fled. Lily calls Chuck to say she'll give him everything she can to help take Bart down. With the confidence that he has Lily by his side, Chuck reunites with Blair and asks, "Will you go to war with me?" Finally! Meanwhile Bart calls Nate and says unless he wants to see the Feds, he'd better cooperate. 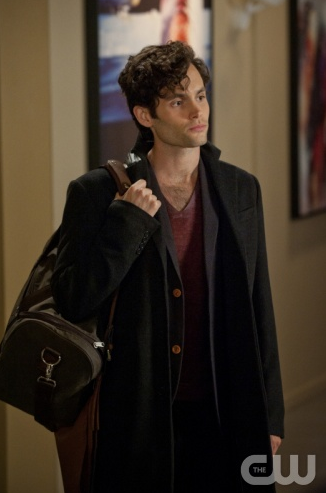 Nate cannot work against Chuck! In the very last scene of the episode we see Dan typing a header that reads, "The Final Chapter." I think he is going to propose to Serena in the final article. I know it sounds crazy, but all of a sudden I have a strong feeling that he is going to make a grand gesture. In previews for the next episode (which is the second to last!) Blair, Serena and Dan watch as a television reporter says a plane went down. I think we're supposed to assume from the horror on Blair's face that Chuck was on the plane. As I have been saying all season, I will not be satisfied if they don't wind up together. What do you think? 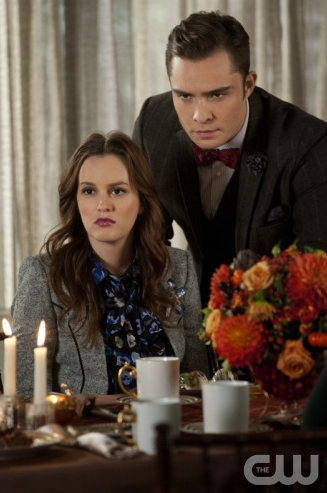 Will Chuck finally take down Bart and marry Blair? No! I didn't catch the 7th Heaven reference! 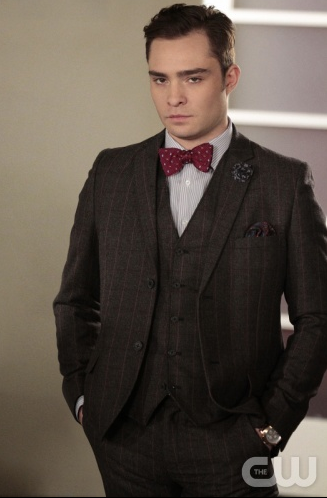 I am in total denial that my Monday nights are now not going to involve Chuck Bass. Dan basically stabbing Serena in the back with her chapter caught me by surprise and seemed a little odd considering he'd been shacked up with her and all lovey-dovey the past few weeks. I really thought they were 100% back together but now we're to think he was just pretending? That pissed me off. Especially because I was rooting for them to stay together. During tonight's episode of 90210 Adriana fixates on taking down Vanessa. She is so hyper focused on proving to Liam and Dixon that Vanessa is bad news that she misses the meeting with the record label (hello, LaToya Jackson cameo!). Before we know it, Vanessa is staging a fight between her and Adriana, Adriana is being dragged off by security and Dixon has to go on stage and perform alone. After all this, Dixon gets offered a record contract, but not with Adriana. They only want him as a solo act. Do you think Dixon will tell Adriana the truth? When NYC Prep first premiered on BRAVO I was unimpressed.